So I wake up with this song playing in my head, which in itself is not unusual as God often wakes me up with a song, and each time He does it means something. The song is by Jason Gray, titled, “With every act of love” and has the lyrics (which are the ones I heard). Immediately I thought about England. How He has yet to open the door. Then I thought of how we used to be a host family for Japanese students. I always thought it was wonderful how we would meet people though the program that we would never have met otherwise. It was a wonderful experience, both for my family and for the student as well (as I gathered from their goodbye letters). I know that God has called me to England for the same reason. There are people I need to meet, and who need to meet me, so that I can be Gods hands and feet. The “open door” for England has not opened, and yet I know that God will open it soon, as He did not lead me all this way for nothing. Please join me in praying for me to receive an open door to England, and for the “ministry” that He has called me to will begin to take shape before me. Please pray also the God will give me the courage and strength to walk through the door, once opened. I covet all your prayers and will pray for you as well. Send prayer requests here abbasyaldah@outlook.com or comment below. As I stated in part one (read it here) my daughter was attacked with a knife by an unknown assailant while she lay sleeping in her own bed, and yet decided to forgive her attacker. I did as well as I never wanted her attacker to take any more than he had already. My husband Allan (her father) made it known that he would “never forgive” the person who had nearly took his daughters life. I understood his angst about his daughter being hurt by a man who came in through a window after he left for work. He wanted to protect her. So I knew it was a big deal, though in the past had wondered how big a deal it was. Not only had Allan decided to never forgive, but he had stopped going to church (when God just had him start). Well one day, months later, my friend had me go to the woman’s Bible study at the church that my husband had been attending (not my own) and then God led me to tell the pastor about what happened to my daughter (and we discussed forgiveness). When my husband got home told me that he was going to start going to church again. He then proceeded to tell me that the church he attends has two locations so each Sunday each one of the husband and wife pastor team will teach at one of the locations. But this Sunday was different. One pastor was away so even though the Woman pastor was due to teach at the location that was not the one my husband went to, she ended up bring the sermon through a simulcast. She taught about forgiveness and she used what happened to my daughter (and how I felt about it) as an example. Now I cannot remember if we prayed or he just nodded his head but I do know that 8 months after my daughter lay in the emergency room, my husband lay in the exact same emergency evaluation room that my daughter had been stitched up in. The difference was that he never left that room to go home… four day later he was gone, cancer took his life. Later as he lay there only hours from death, as we prayed over him, God very clearly spoke something to my spirit (when I wasn’t even thinking about it at all). I never again doubted how seriously God took forgiveness…it is a huge deal to Him. He did all that, manipulated all those circumstances, so that Allan would be able to forgive before his death and final judgment. 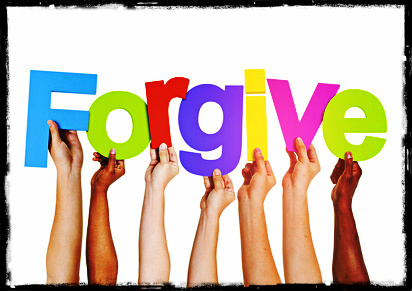 Do you hold unforgiveness against someone in your life? Give it to God, forgive and let it go. It is not as important as your soul!